It is not enough to have known higher states of consciousness during meditation only when sitting still. It is necessary to try to maintain this state of self-recollectedness as much as possible in action also, so as to become a channel between the high and the low, bringing down this divine flame to the inferior planes of being and of existence, in oneself as much as in outer life where it is needed. Without the descent of this sublime light into these somber regions of oneself and life, there can be no transformation—either for the human being himself or for the other sentient creatures and things around him that are dependent on him for that. The accomplishment of this holy aim can take place only through the conscious efforts of a seeker to transform himself first—which calls for a great uphill struggle from him, with a certain self-sacrifice in the service of the Divine. Failing this, the flame of Divine Consciousness will continue, as always, to shine forth its radiance in the higher realms of being, while the lower planes of existence will remain cut off from it, enclosed in a shell of mist and deep obscurity, ignorant of this effulgent light. Thus, one can perhaps begin to understand better the role the human being is destined to fulfill in the Universe, what is required of him, and his importance as a link between the Supreme Cosmic Mind and Creation in all its diverse manifestations. 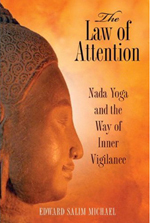 That is why it is now necessary to approach a new and important meditation exercise, using as a support for one’s attention an extremely slow and special way of walking in order to learn better to maintain this vital state of self-awareness in movement and, later, in all one’s outer life activities as well. This particular form of meditation cannot be practiced outside but only when alone in private—for reasons that will become obvious to the aspirant when its details are given further on. When the seeker has worked with this spiritual exercise for a certain time and has become sufficiently acquainted with it, not only will he derive from it an immense benefit and aid to become more conscious of himself in action, but he will find it of special value when, on days of excessive outside harassment, bringing with it physical and mental restlessness, he may encounter too great a resistance in him to settle down and meditate in a seated posture. Because of the exceptional slowness with which this walking must be performed, and because the body itself actively participates in this spiritual work, it will have a particularly calming effect, on both the physical and the mental planes. The aspirant may, in any case, later find this slow way of walking extremely useful as a prelude to his daily meditation, even though it be performed for only a few minutes. And, through repetition, it will act as a special signal and inner preparation to help mobilize the seeker, putting him in the right frame of mind before taking his customary seated meditation position. This particular way of walking can be of yet further value between two long meditation sittings to relieve muscular strain or cramp without having to interrupt the continuity of one’s concentration. This new spiritual exercise should be learned and practiced in several stages, as will now be explained. The seeker should always begin by standing very still for a minute or two to make contact with the whole of his body and—as with his Hatha-Yoga practice—seek a special inner axis in relation to his back and spine. If he is inwardly receptive and learns to allow his body to achieve it, he will find that his body will subtly start adjusting its position from the inside toward the outside of its own accord. Gradually, it will begin to straighten and lengthen through mysterious, almost imperceptible internal muscular movements. When the aspirant finally feels that he is well related to his body—”inhabiting it” in a manner that he ordinarily almost never does—he should bring in a global physical sensation of the totality of himself. He must also become very attentive to the Nada inside his ears and head and, at the same time, expand his consciousness out in all directions beyond the walls of his room. All these necessary preparations should, to a certain extent at least, have helped put the aspirant in another state, an unusual state of self-awareness and inner presence that is not his customary one. He may now begin the walking, which must be performed with an exceptionally slow movement of the feet—at the same time taking the utmost care to maintain the upright position and inward poise his body has established without gradually stooping, as he may be inclined to do after a certain time of walking. He must also remember continuously to push his head gently upward toward the ceiling, lengthening the neck from behind with the chin slightly bent inward toward the throat—an attitude that he must also learn to adopt in all his seated meditations, since it is an attitude that will act as an additional and special help for him to remain alert and concentrated. It is also of particular importance that he keep his attention firmly directed to the motion of his feet as they move forward. He should be fully aware at each fraction of a second where his foot that has just left the ground is, attentively following it throughout the whole period it is moving in the air until it finally comes down and touches the ground again. Then his attention must straightaway turn to the other foot and, in a likewise manner, he must be vigilantly conscious of its every movement from the moment it leaves the ground to the moment it comes down again. Each step forward must be very small. The heel of the foot that has advanced forward should not go beyond the tip of the toes of the foot which is left behind. While walking, the aspirant should be looking “through” the walls of the room without letting his eyes settle on anything, so as not to become distracted by the objects that may be around, surreptitiously giving birth in him to a multitude of thought associations. When he has walked over to the far end of the room, it is important that he not turn around each time in a different and haphazard manner. He must always use the same wall of the room as a landmark to do the turnings in order to face the opposite end. That is to say, if on arriving at the far end of the room he decides to turn around from his left side, then, after having walked across again to the point he originally started from, he should this time turn around from his right side. And he must keep strictly to that rule for the whole of the day’s practice. If one does not have at least some intuitive understanding of the importance of this work from the very beginning, what is at stake for oneself and the vital necessity to persevere in the struggle to remain vigilant and conscious of oneself, one will quickly tire of making such efforts, preferring the ease of one’s customary state of oblivion and inner sleep. But if a seeker is really sincere and serious in his quest, he will be deeply concerned to discover that he is unable to walk from one end of the room to the other without falling asleep in himself! In the beginning, he will again and again keep forgetting himself, continually losing the awareness of his existence throughout the whole time of his practice. It is vital that each time this mysterious inward movement—of abruptly coming back to himself—takes place in him, bringing with it a curious feeling like a sudden inner awakening from an inexplicable hypnotic state, he should consciously note the fact that he was absent the instant before without in any way being irritated with himself or discouraged. Furthermore, he has to learn to appreciate the importance and deep significance of this enigmatic inward movement that secretly occurs in him, subtly illuminating his being in such a way as to bring about this strange feeling of having been roused anew from an incomprehensible mesmeric sleep, thus rendering possible the perception of another state of consciousness behind it, far removed from his habitual one. The aspirant should quickly take all this in without interrupting his walking in any manner—all the time using the movement of his feet as a temporary support for his attention. He must take care not to accelerate the speed of his walking involuntarily, through habit, as he will often be inclined to do in the beginning if there is no one to watch over him. Moreover, every time he encounters resistance in himself to remaining attentive to the motion of his feet, he should then slow down his walking still further. This will help redirect his attention back to the movement of his feet. When the seeker’s concentration has become very sharp and sustained, he will be astonished to perceive how shrill and strong the inner mystical sound vibrates inside his ears, like a divine token benignly assisting him and inspiring in him the desire to make yet further efforts.